‘Electronic governance’ became a key phrase in the Indian State’s efforts to provide a facelift to its administrative machinery in late 1990s. It is now geared for ‘good governance’ as part of the structural adjustment strategies dictated by the World Bank and other international agencies. Since the institution of the Ministry of Information Technology, the central government has shown substantial interest in using IT for various objectives. The surging numbers of what is identified as e-governance projects since 1999 indicate that most of the State governments and Union Territories in India claim to have accepted the need for undertaking e-governance initiatives. In Kerala, since Government is very much a part of common man’s life, Information Technology, has been a natural choice for the Government. In the State, the introduction of ICT in Government citizen interaction has been more gradual rather than making a sudden impact on the G2C landscape. States’ first IT policy announced in 1998 delineates reaching ICT to the common man, as one of the four focus areas. The state though subsequently gave thrust on promoting IT industry base, its primary focus on citizen services was still the underlying thread in ICT interventions (Baby, 2006). The State of Kerala has shown remarkable progress on all indicators of social development. Kerala has a much thought out and much discussed policy for the ICT enabling also. Kerala is among the front-runners in implementing e-governance in India. Introduction of e-governance and the use of computers in the government of Kerala may be traced back to the 1950s (Planning commission, GOI, 2008). Kerala was the first State government in the country to come out with IT policies aimed at co-coordinating and accelerating the pace of IT and e-governance projects. In 1998, the policies were focused mainly on creation of IT infrastructure in data communication and IT education. In 2001, policies were broader and covered industries like Information Technology Enabled Services (ITES) and provided for liberalization of labour laws. The IT Policy (2006-07) envisages making each citizen of Kerala a creative participant and contributor of the Knowledge Society through the use of ICT. The IT Policy 2012 has also underlined the commitment of the Government in spreading the wings of e-governance in all walks of life. Given the basic premise that Government should adopt ICT for citizen services, a quick glance at the proven models of service delivery using ICTs in Kerala shall reveal a promising scenario. Major achievements of Kerala in the e-governance front during the past years include India’s first fully computerised Panchayats, India’s first fully computerised Collectorate, FRIENDS initiative to serve 35 lakh families, first largest deployment of wireless network in the World, significant development in local language computing, Akshaya’s total-literacy programme, first Citizen’s Call Centre in the country, first complete e-literate district in the country etc. The State government has also initiated the ‘Information Kerala Mission’ project for the deployment of technology at the grassroots level as a model for participatory governance through effective use of IT. This study is carried out to examine the working of FRIENDS (Fast, Reliable, Instant, Effective Network for Disbursement of Service) implemented by the Information Technology Mission of Government of Kerala. The basic objective of the study is to examine the beneficiary perception about the programme and also to see how far the project has been successful in reducing the time and cost of availing public services. FRIENDS is based on the concept of using ICT for better citizen Government interface. It started off as a pilot project in June 2000 with a ‘collect and remit’ and ‘receive and forward’ principle. A year later, all 14 districts had one centre each. Though the idea of FRIENDS had its origin from the e-Seva project of Andhra Pradesh, there are some differences between the two. While the original inspiration for FRIENDS came from e-Seva, FRIENDS represents an attempt to promote single-point front-end service delivery without any real backend computerization. Nor does FRIENDS charge departments for effecting transactions on their behalf with the exception of the publicly-owned telecom company, BSNL. Unlike e-Seva, whose counters are staffed by, hired by private partners, FRIENDS counters are staffed by employees appointed by parent departments. Centers, however, are not networked to each other or to individual departments. Unlike e-Seva, FRIENDS has not allowed its centers to be used for delivery of private services; nor has FRIENDS turned to advertising to generate revenue. In spite of the fact that FRIENDS is clearly more “basic” than e-Seva, an opinion survey commissioned by the World Bank in 2001 indicates that FRIENDS has struck a positive chord with Kerala’s citizen (Madon and Kiran, 2002). Table 2 is a testimony of the peoples’ faith in e-governance programmes like FRIENDS. From a mere Rs.568 lakhs in 2000-01, its collection has risen to Rs.23,500 lakhs. Similarly, the number of transactions increased from 1.24 lakhs to 3.52 lakhs during the period of study. Why do people prefer FRIENDS Counter over Departmental Counters? To the question of whether the respondents prefer FRIENDS counter over the Departmental outlets for utility payments, almost all of them prefer to pay at the FRIENDS. Gender-wise, women particularly prefer to be at FRIENDS for their public utility payments. 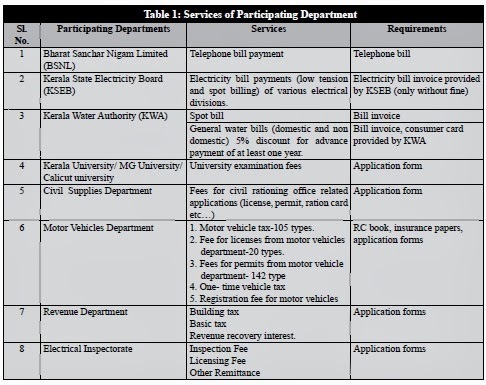 The information provided in the table-3 indicates that the prominent factors for utilising the FRIENDS counter for paying public utility bills over the Departmental counters are : its low cost and time saving mechanism, the queue system and its speedy and efficient functioning. It hence attests the fact that the objectives of the e-governance system are very much prevalent in the FRIENDS functioning. Data have been collected from the respondents about the cost incurred for availing service in both the Friends and Departmental counters and an independent t-test was applied to see whether there exists any significant difference in the cost of availing services from both the agencies. The results confirm significant difference (t =10.58, p=0.000). and hence conclude that the cost of availing service through e-governance system are lower than the traditional method. We have also tested whether there is any significant difference between the two systems in terms of service time. The result shows significant difference between the two systems (t =14.66, p=0.000). Hence to conclude that the service time required at the Friends counters are less than the departmental counters. The beneficiaries of Friends were asked to indicate their opinion about the three major factors they consider the most important attributes of the e-governance application. The important probable attributes of e-governance systems have been presented before them and they were asked to rank them. From the table-4, it is seen that convenient working time is the first foremost attribute of the e-governance system they considered important. FRIENDS working time stretches from 9.0 a.m to 7.0 p.m and work even on holidays. Location of the FRIENDS counter is considered as the second attribute of the system. The FRIENDS counters are working in district headquarters easily connected with all transport system. The third attribute of the system as per the users point of view is the scientific queuing and display systems in practice at FRIENDS. It helps avoid standing on long queue under the hot sun or rain to avail a public service. From the discussion, it is clear that e-governance initiatives like FRIENDS have been found successful in ensuring good governance. Studies of Krishnan (2010) and Mad on and Kiran (2002), to mention a few, have brought into limelight the efficacy of FRIENDS in delivering public sector services at low cost in terms of time and money. However, the project is to be strengthened in several ways. In terms of addition of more services, there seems to be stagnation. Similarly, FRIENDS has not been able to provide the information services. In addition, the operational area of FRIENDS still confine to the district headquarters. The reluctance of the parent departments to spare staff to man FRIENDS counter is a real challenge of the project. The economic sustainability of the project is in peril as the beneficiary departments are unwilling to pay any service charges to FRIENDS and it continues to rely on budget subsidy from government for operating costs. Departments argue, correctly, that they are already subsidizing FRIENDS by paying employee salaries. Finally, the absence of significant backend computerization or business process re-engineering in departments has made it difficult to expand the menu of government-offered services from bill and fee payments to more sophisticated transactions, such as certificates. Despite these limitations FRIENDS has proved meritorious service to the people at large. C Krishnan The author is Associate Professor in Economics, Government College, Kodanchery, Kozhikode, Kerala.